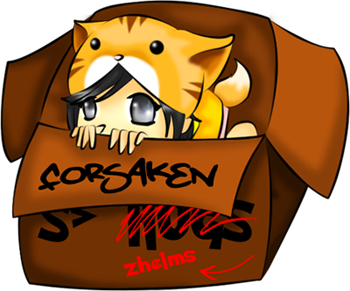 Forsaken Zakum occurs Monday-Friday @ 8:30 pm PST - 10:00 pm PST (GMT -8 Time help) and periodically on weekends. IGN: BluexDesire usually hosts forsaken runs. Forsaken has been selling helms since the start of the guild in February 2008. We have helmed over 700 players in bellocan. Buy with complete confidence. Forsaken JR's; Paradisea, BluexDesire, iTess and motomage take the utmost care with your privacy and information. To buy you must be lvl 50+. Thief/warrior/bowman should buy 300-400 cheese. Mage/priest should buy 250-350 ginger ales. AVIP + VIP buyers who need quest services: please have extra pots/(1)Return to Dead Mine scroll (may be found in FM). If you use windows vista and experience issues at Zakum please visit this page. Remember: have your character in the town of El Nath! Our Guild FM is located @ channel 19. If no contact is online feel free to visit and inform any forsaken member of your intent to purchase a Zakum helmet or contact us via the site and a sales member will try to contact you ASAP. Zakum helms from forsaken are available daily in free market. Pricing begins at 70 million meso and up, based on the stats of the zhelm. To view our current inventory click here or locate a mule in free market. /find IGN these mules to locate a forsaken zakum helmet in free market. You will send payment, along with a random etcetera (ETC) item via the NPC (non-playable character) Duey. We will play your account at zakum. This is not an option when buying Auto - SVIP. To buy A-SVIP please visit the order page here, READ all information to understand the process. complete and send the order form. With A-SVIP you only need to pay and provide account info. We handle everything else. Items included with package are: 30 gold zombie teeth if quest is required and potions. Be offline by 7:30-8:00PM PST until 10:30PM PST (GMT -8 Time help) so we can access your account. With SVIP you only need to pay and provide account info. We handle everything else. We will play your account at Zakum. This is not an option when buying SVIP. We will play your account at zakum. This is not an option when buying AutoVIP. To buy AVIP please visit the order page here, READ all information to understand the process. complete and send the order form. Gold zombie teeth are NOT included. Gold zombie tooth may be acquired in the Free Market or by hunting minor zombies. Quest help can be found here. Have 30 gold zombie teeth (if quest is needed) and a return to dead mine scroll (if possible) on the account. If you do not loot a helm on the run, pots used will be refunded and you will attend the next run. Have 30 gold zombie teeth and a return to dead mine scroll on the account. If you would prefer playing the account at Zakum yourself, please say beforehand. Be offline by 7:30-8:00PM PST until 10:30PM PST (GMT -8 Time help) so we can access your account. If playing the account yourself be on by the same time and in El nath, The party leader will contact you when ready. You will play your account at Zakum. Completing the quests is your responsibility. Quest help can be found here. Be online @ 7:00-8:00PM PST (GMT -8 Time help) so we know you are online and schedule you for the run that night, be in El Nath and listen to the party leader. If you die @ Zakum, we will revive if possible. NO refund will occur if you fail to loot after two tries. A try is considered used if you D/C during Zakum or if you repeatedly die and revive is exhausted during the Zakum run. For an additional 10m we will play @ Zakum for you. If you survive the run but do not loot a helm, potions will not be refunded and the run does NOT count as a try. Onyx apples can be used as payment for a Zakum helm, the total is package price ÷ the average price of a onyx apple. Given that onyx apple prices fluctuate please ask a sales member for the exact number. Forsaken also dose not guarantee onyx apples will be taken as payment, message a sales member before hand to find out if we are currently accepting onyx apples as payment that day. Once speaking to one of us we will go on the bank character, IGN: ForsakenZak. This is the character you will pay for your zakum helm. This is the one and ONLY character designated to take buyers money for forsaken Zakum helmet sales. Do not pay any other character unless specifically noted by one of the three players above; BluexDesire, motomage or iTess. Feedback is welcomed, to do so you can please visit Our feedback form. Site registration is not required. You may also ask questions and obtain support here. Buyer Status is updated here. Once receiving your zakum helmet please change your password and pin if possible. Currently, buyer info is only seen by BluexDesire, motomage, iTess and/or a trusted member who may play your account at Zakum. Feel free to request who will be playing your account at Zakum and we will inform you of their IGN. This provided, please do not message or contact the player until you have received your helm and if you do contact the member please do not ask/spam them questions, if you have any questions/comments please direct them to one of the Zakum contacts only. Don't be a hater, situations happen and we will work with you as much as possible. We want the transaction to be an easy and enjoyable experience. Thank you for buying from Forsaken!